We recognize that having even the most professional workmen around can be unsettling. We do everything possible to minimize your inconvenience. Your exterior painting project will be properly staffed to ensure that it is completed quickly and professionally. We will communicate with you so that you know when we are coming and what to expect during your project. Let us know what your expectations are and we can usually meet or exceed them. We are professionals. We have been doing work in the Fairfield Westport area for over 20 years. 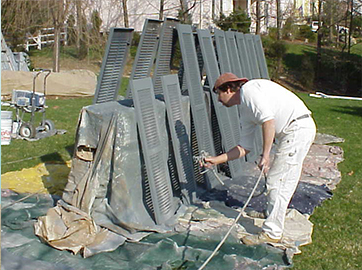 Our house painting system includes professional surface preparation. Surfaces are washed, loose paint is removed, Cracks are caulked, and holes are filled. Care is taken to protect your plantings and hardscapes. We do a clean up and site inspection at the end of every job. We brush and roll over 90 % of the houses we paint. We do have spray equipment and the expertise to use it. Let us know if you have a preference. We’ll give you our opinion and will let you decide how the material is applied.